In November 1943 this painting was included in Jackson Pollock's stunning solo exhibition at Art of This Century, the innovative New York art gallery run by legendary art patron Peggy Guggenheim. As its title suggests, the work depicts a male figure, embodied in the black columnar form at right, with its mysterious arithmetic graffiti, and a curvy female figure at left, with marvelous catlike eyelashes. Standing on tiny triangular feet, both figures are surrounded by splashed and smeared oil paint that enhances the sense of energy inherent in the two vertical forms, while also foreshadowing the famous "drip" technique that Pollock would develop later that decade. Male and Female was the sole illustration to the catalogue of Jackson Pollock's first one-person exhibition, held in New York in 1943. It was a shocking painting in a shocking show that critics described as "volcanic" and "explosive." While the painting reveals Pollock's interest in contemporary European art, it introduces an unprecedented freedom with paint. This is particularly evident in the upper left, where a seemingly random burst of streaks and splotches foreshadows the "drip" painting that would become Pollock's signature style. The subject is an archetypal one, reflecting Pollock's desire to return painting to issues of primal significance. The female is identified by her bright red curvy torso and marvelous eyelashes, and the male by a column of numbers. These signifiers correspond to archetypes of the woman as sensual (nature) and the man as intellectual (culture). This painting thus seems to address both the unity of male and female, joined to form one blocky construction, as well as the interplay of their opposites. Ann Temkin, from Philadelphia Museum of Art: Handbook of the Collections (1995), p. 327. Male and Female made its public appearance in November 1943 in Pollock's stunning first exhibition at Art of This Century, the innovative gallery run by art patron Peggy Guggenheim. In a contemporary statement about another painting, Pollock challenged potential analysts of these enigmatic new pictures by declaring that "any attempt on my part to say something about it . . . could only destroy it. "1 This statement offers a good deal of information: that Pollock wished viewers to place faith in his paintings as mysterious, mystical beings, somewhat like silent gods who reign over human beings yet are still vulnerable to their words and deeds. His allusion to possible destruction implies that, like a fire at risk of extinguishment, the painting is a vital force. This yearning to believe in the power of art had drawn the attention of Pollock and his young New York contemporaries to societies in which art had a magic power. Their ethnographic curiosity was, in part, inspired by the many European Surrealists in wartime exile in New York, whose own experiments in "automatic," or improvisational, painting also intrigued the Americans. Critics have attached significance to Pollock's presence at a demonstration by Navajo sand painters at the Museum of Modern Art the previous year, but this was only part of his larger interest in art that had a social function beyond that of decoration. 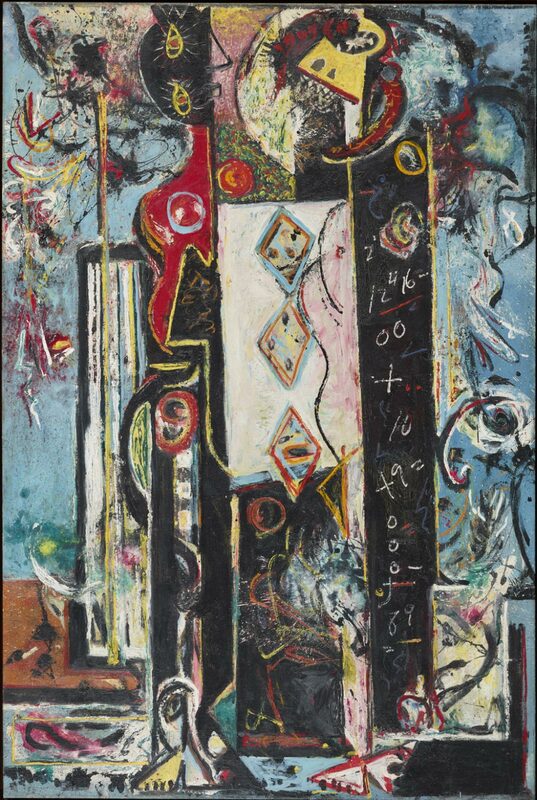 Pollock's title for this painting points to the fundamental forces he wanted it to conjure. The male is probably embodied in the black columnar form at right, with its mysterious arithmetic graffiti; the female in the curvy form at left, with marvelous eyelashes and round breasts displaced as Picasso might have done. Both figures, standing on tiny triangular feet, form a single blocky construction in a whorl of splashes, smears, and stripes that develops the energy immanent in the two vertical figures. Pollock has sparked a painting by rubbing together two opposing elemental forces, eternally interdependent and often explosive. Twentieth Century Painting and Sculpture in the Philadelphia Museum of Art (2000), p. 81. 1) Sidney Janis, Abstract and Surrealist Art in America (New York: Reynal & Hitchcock, 1944), p. 112.